below you see the layouts with measurements. SMT non-DIY for me. Very compact and neat. Just to clarify, this is an input attenuator that would be zero at 12 o'clock and provide positive (clockwise) and negative (counter clockwise) amounts? 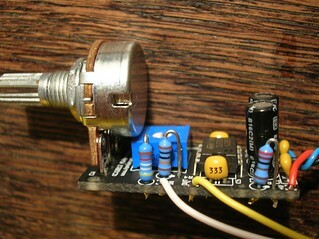 caps and resistors are 0805, OpAmp in SOIC. One suggestion: larger pads for cases where it makes sense to solder wires on directly instead of mounting connectors. I usually have such a tight space to work with add-on/daughterboards. SMT is a perfect solution. One suggestion on the SMT version. SMT electrolytics are fragile. They have a tendency to be easy to break off the board. They also tend to be no smaller than through hole electrolytics, and cost more. 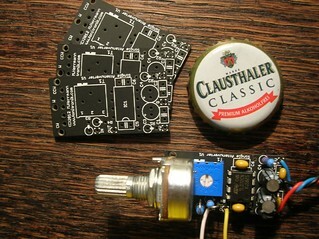 On my SMT boards, whenever I have electrolytics I simply use through hole electrolytics. You can get them in fairly short stubby versions. TH 100% DIY, or SMT pre-assembled. Have managed to solder SMT but my good those parts are small. 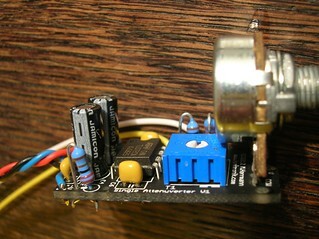 TH DIY or pre-assembled SM. What would the price difference be? couldn't you just leave the holes open and let us solder the two TH elec. caps if the majority would prefer a pre-assembled smt? I'm just thinking about when I try and stuff all my wiring behind a panel and how easy it is to break them little smt caps off. not yet, need a quote from the PCB assembly service first. Would you mind posting this schematic, Matthias? More caps than I usually see on an attenuverter! 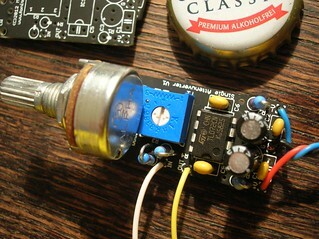 it is the same circuit as on my attenuverting mixer. i just decided to have a complete supply power filter/decoupling using a 22R resistor, 10uF, and 100n on each rail. and then there are two 10n decoupling caps for the opamp. I'll join the chorus and say my first choice would be SMT pre-assembled and my second a bare TH DIY board. The determining factor for me would be the price difference.